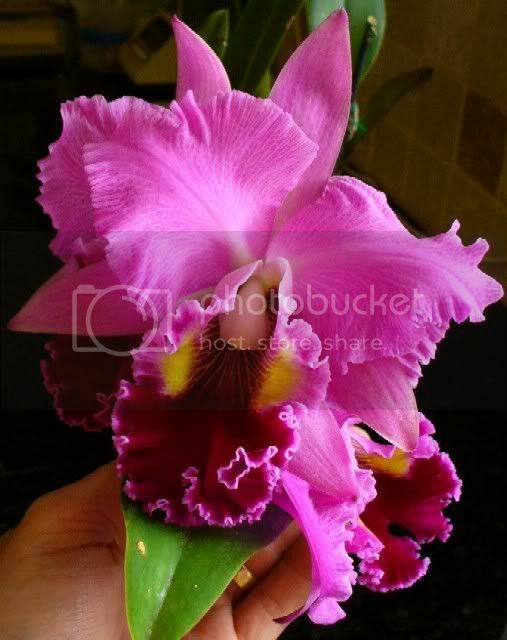 Thread: Best color orchid to give a girl? I got my wife this one, but I take care of it. She doesn't even know it is hers until it blooms like today! does she take intrest in youre CP's? What color does she like? Has she ever said something like youre Nepenthes look like a male organ, or something disgusting you might do to a nepenthes?? If she is interested in plants and keeping them does she know how to, or does she care about orchids? Preaty frilly colorfull (girly colors) simple shapped Orchids are a good way to go as well. Clint that looks like that fredsomething or another or something like that. Its is a new hybred that is the blackest looking flower to date. One out of a bunch of seedlings exibited that color. It was in the AOS magazine. I forget the cross used to make it, but the flower is sooooo dark that it looks BLACK. But folks are correct there is no black pigment to make a TRUE black flower. It looks black to us, but it is actualy very dark purple and reds to make that black coloration. The orchid flowers of red and pink colors are mostly liked by the girls. Last edited by billyborden42; 04-08-2019 at 04:24 AM.